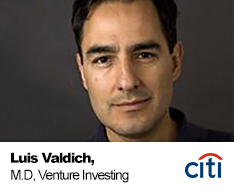 Luis Valdich joined Citi Ventures in 2015 as a Managing Director in its NYC office. He is responsible for fintech investing in both the U.S. and Europe. Luis embraces Citi Ventures’ “best of both worlds” corporate venturing model of combining value-added strategic investing with venture capital best practices by investing in high-potential startups and driving engagement with Citi executives and clients. Luis’ investments include Clarity Money (acquired by Goldman Sachs), HighRadius, PPRO, ScaleFactor, Contguard, and SmartAsset. Prior to Citi, Luis founded and ran JPMorgan Chase’s Strategic Investments group for nearly 8 years and invested in 30+ companies, notably Square, Markit, BATS/DirectEdge, Air Lease Corp, LME, clearXchange (Zelle), Symphony, and Tradeweb. Previously, Luis was a consultant at McKinsey and venture capital principal at Softbank. Luis received his MBA from Harvard University and BA from Franklin & Marshall College. Luis lives in Ridgewood, NJ, with his wife and kids and loves skiing, tennis, travelling, reading, and celebrating life with bubbles.